Since 1996, Event Solutions has been giving corporate, association and independent event and meeting professionals the resources they need to navigate the rapidly changing landscape of the industry, from cutting-edge features on trends and technologies to behind-the-scenes profiles of some of the industry’s most prestigious events. 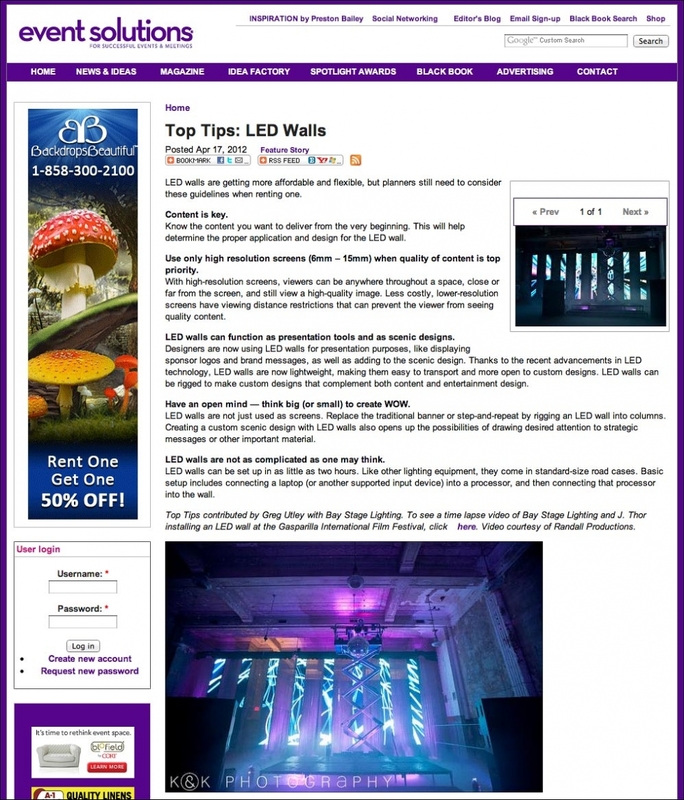 Today Greg Utley of Bay Stage Lighting offers his expertise on the proper use of their cutting edge LED wall at events. Check out the feature to see our images from GIFF2012 and to see what Bay Stage Lighting, J. Thor and Randall Productions cooked up at the festival for their guests and artists–amazing stuff! And be sure to check out the rest of our content from the festival HERE if you haven’t seen it yet.